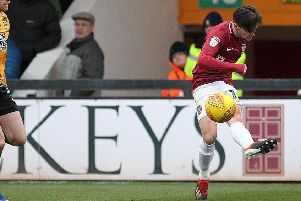 Northampton Town have opened up a waiting list for supporters wishing to purchase tickets in the east stand for Saturday’s Sky Bet League clash with Notts County at Sixfields. The Cobblers could be promoted with a win over the Magpies, and with the north and west stands already sold out, demand is expected to be high for the refurbished east stand. The club can’t yet sell tickets for the east as they are waiting for the go-ahead from the Safety Advisory Group (SAG) before sales can begin. Ticket prices in the east stand will be: Adult £20; Senior £16; Students (members only) £16; Under 18s £8; Under 7s FREE. Should any tickets remain for sale on the respective matchdays, the normal match day premium of £2 will apply. Saturday could be a party atmosphere at Sixfields, as the Cobblers could be promoted to Sky Bet League One. The scenario is, as the Cobblers currently lead fourth-placed Accrington Stanley by 16 points, and fifth-placed Bristol Rovers by 18 points, with seven games to play. This means, if the Cobblers beat Notts County, Accrington lose to Cambridge and Bristol Rovers don’t beat Crawley Town, the Cobblers will confirm theirt return to league one after a seven-season stint in league two.